This page describes the Connect to Jira tab of the Fisheye setup wizard. Connecting Fisheye to a Jira application allows you to manage your users with Jira. See Connecting to Jira for user management for more information. Configure the following setting in the Jira application: Allow remote API access. Admin Username The credentials for a user with the 'Jira System Administrators' global permission in the Jira application. Fisheye Base URL Click Advanced Options to see this field. 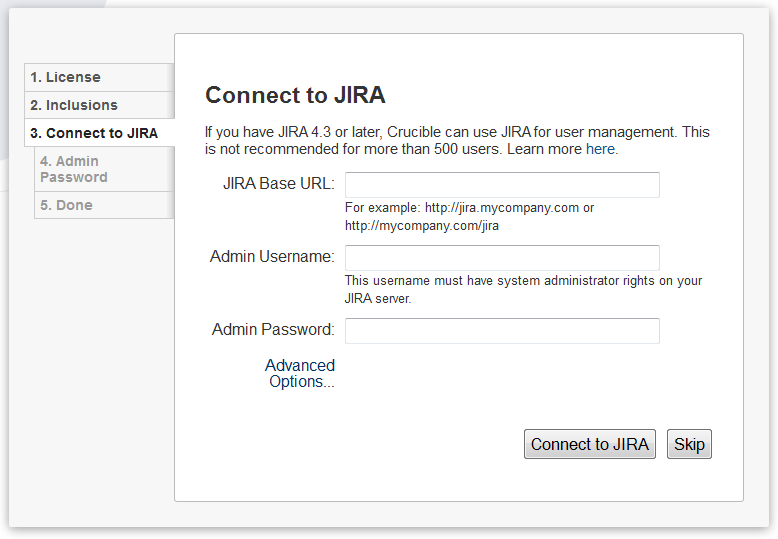 The Jira application will use this URL to access your Fisheye server. The URL you give here will override the base URL specified in your Fisheye administration console, for the purposes of the Jira connection. Groups to Synchronize Click Advanced Options to see this field. Select at least one Jira application group to synchronize. The default group is jira-users. The Jira application will synchronize all changes in the user information on a regular basis. The default synchronization interval is 1 hour. Admin Groups Click Advanced Options to see this field. Specify a Jira group whose members should have administrative access to Fisheye/Crucible. The default group is jira-administrators. Error rendering macro 'includeplus' : The connection between FISHEYE and JIRAHOOKUP does not exist anymore.